On the other side of the skies, there is a girl with wings carried endlessly by the winds of a tragic past. Misuzu may not be that girl, but she sees her in her dreams. A lively and outgoing, but nevertheless lonely soul, Misuzu lives with her aunt away from her parents. One summer day, she stumbles upon a wandering puppeteer and soon invites him to stay with them. 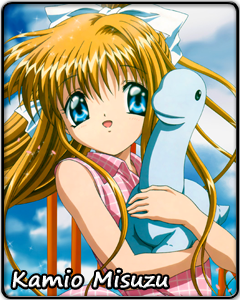 Misuzu wants a friend. He wants to find a girl with wings. Their goals fit well enough. Misuzu enjoys the new company and happily shares her boundless energy and enthusiasm. Why is a girl so full of cheer condemned to solitude? The secret behind her suffering soon rears its ugly head. Misuzu wants to be happy like everyone else, but what if happiness itself is her forbidden fruit? Misuzu has chosen the path of strength in the face of overwhelming adversity. She is determined to move forward, even if each step she takes grows more and more painful. She will smile even as her eyes overflow with tears. If those closest to her can accept this indomitable determination with all it entails for her, she might one day be able to spread her wings and rise into the sky.